Enter nutritionist-author Heather Bauer, of Bread is the Devil and Bestowed fame — and our culinary compass. Bauer steers us toward the healthiest choices on restaurant menus of any type. 1. Any starter salad with a vinaigrette dressing — and go easy on the cheese. 2. A veggie side — as a starter. Anything sautéed or steamed is a good bet, but get it without the sauce (or ask for it on the side). Roasted vegetables, like kale or Brussels sprouts, also start the meal off right. “They provide that crunch and texture,” Bauer says. Plus, picking at them sort of approximates the experience of digging into a plate of french fries. Sort of. 1. A turkey burger, veggie burger, or plain ol’ fashioned hamburger — but with some caveats. Really think about the restaurant, Bauer says. If it’s the type of joint that prides itself on its clean, high-quality ingredients, go ahead and order the burger base of your choice. 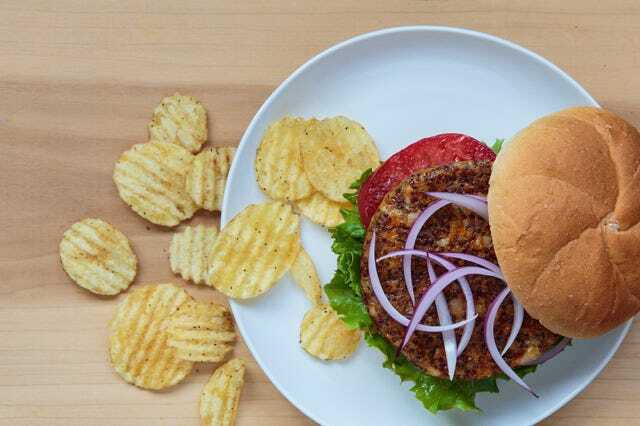 But, in other restaurants, “healthier” options (think veggie, quinoa, or turkey burgers) are actually packed with calories, thickeners, and “bread crumbs galore,” Bauer says. Always go easy on the cheese, and load your burger up with veggies (like sprouts, lettuce, tomato, peppers, and pickles, if you’re not salt-sensitive). Maybe even bypass the bun for a lettuce wrap, or just eat it open-faced. 2. A turkey sandwich on rye. Ask for it with low-sodium turkey and lettuce, tomato, and mustard. 3. A BLT. Yes, really! But ask them to go easy on the mayo (or skip it altogether), and see if turkey bacon’s an option. 4. If you’re at a farm-to-table joint, any grilled protein with a side of vegetables is usually a good bet, Bauer says. 1. Chicken wings. Every wing is at least 100 calories before you dip it in bleu cheese. Commit that to memory. 2. French fries, and not just because they’re fried and seriously caloric. “French fries are a trigger food,” Bauer explains. “It’s difficult to eat just a few of them.” If you simply can’t resist, remember the size of your fist equals one portion. Stop there. 3. Turkey clubs. Most restaurants stack on an extra slice of bread or two, making these extra-carby. 4. Surprisingly dense farm-to-table offerings. Sure, farm-to-table means fresh, and that’s absolutely a good thing, Bauer says. But, people often confuse local and organic with low-cal. They think, “Oh, farm-to-table! Olive oil! It must be healthy!” she says. But certain pastas, eggplant dishes soaked in oil, or anything with a lot of sauce, cheese, or heavy carbs are calorie-bombs, no matter how natural.